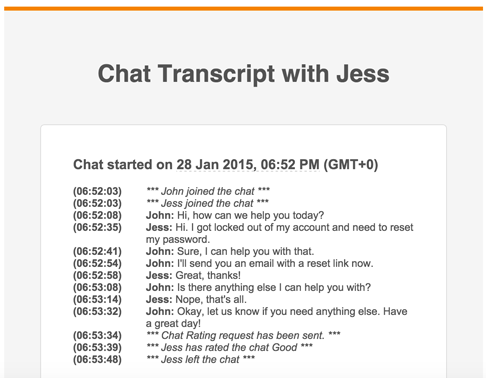 With email piping, you can have all chat transcripts from your Zendesk Chat sent to one or more email addresses. Each Zendesk Chat email address you enter receives a detailed transcript when a chat is over. On the dashboard, select Settings > Account > Email Piping. Enter an email address that should receive transcripts. To add another email address, click the + next to the field. When you've added all the email addresses you want, click Save Changes.